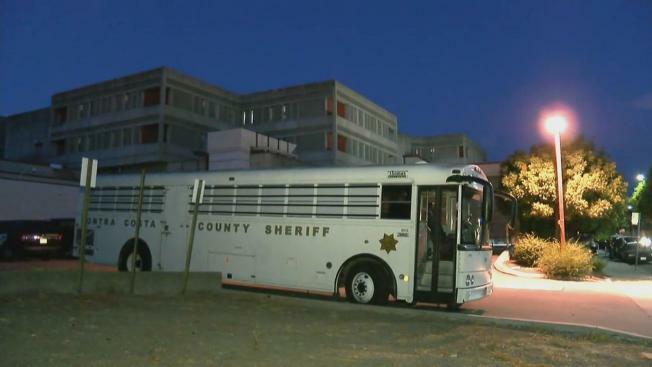 File image of a Contra Costa County Sheriff's Office bus. Police on Friday night called off a search for a woman who escaped custody in the vicinity of a Contra Costa County jail, authorities said. A woman in the custody of the San Pablo Police Department was being transported to the Martinez Detention Center, but she ran off before they could get her into the jail, officials said. The incident was reported on Twitter around 7:35 p.m.
San Pablo and Martinez police have set up a perimeter in downtown Martinez and are searching for the woman. The woman is described as a 28-year-old black woman, standing 5 feet 6 inches tall and 145 pounds. She was last seen wearing black pants, a gray sweatshirt and was handcuffed. Around 8:45 p.m., Martinez police reported that due to the non-violent nature of the woman's original crimes the search has been called off.